Homemade sponge cake is lighter, fluffier and tastier than any store bought variety. They are a great cake for any occasion and are always a crowd pleaser. Unfortunately, many people feel intimidated when it comes to making a sponge cake. This is because there are a few extra steps involved. But let me tell you, they are worth it. These steps are what makes it light and fluffy – the 2 things that take a sponge cake to the next level. After trying this recipe, you won’t be one of the intimidated ones! Just follow my steps and recipe, and you’ll have a winner. 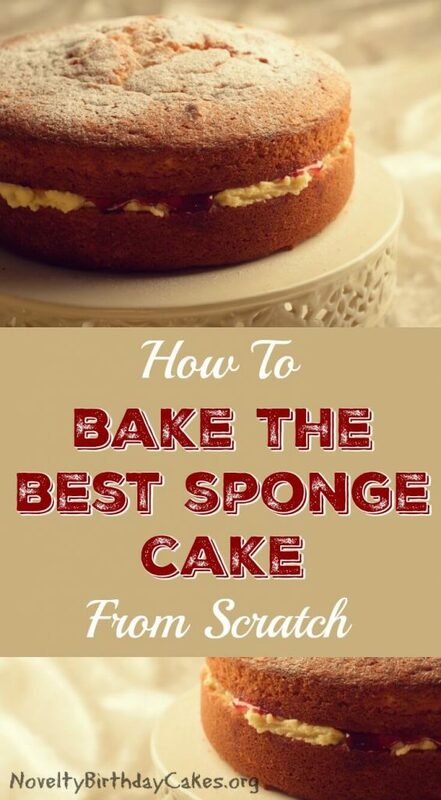 Here is my recipe to make the best sponge cake from scratch. This is brushed onto the cake after it has cooled. It gives a nice, light sugary crust. Whisk together the egg yolks, sugar and vanilla in a large bowl. Set aside. 4. Add the egg whites to bowl of mixer and process mix on high speed until stiff peaks form. 5. Fold half the egg white mixture into the egg yolk mixture. 6. Add the flour, oil and milk and mix until well combined. 7. Finally, fold in the remaining egg whites carefully, making sure the mixture stays light and fluffy. 8. Pour the mixture into the prepared pan and spread to ensure an even top. 9. Bake in pre-heated oven for about 25-30 minutes. When ready, the top of the cake should be light brown and spring back if you push your finger gently in the middle. You can also insert a toothpick in the middle to ensure it comes out clean. Remove the cake from the oven once it’s ready. 10. Run a butter knife around the edge of the cake pan to separate the cake from the sides of the pan. This prevents the cake from being pulled to the sides of the pan as it cools. It will shrink on cooling and this ensures it is even. 10. Let the cake cool for about 10-15 minutes and then remove it from the pan. If you’ve used a springform pan, open it and gently remove the cake onto a cooling rack. If you’ve used a regular cake pan, put a cooling rack on top of your cake. Flip the rack and cake together and gently tap the pan to release the cake. You may need to loosen the cake further with a knife along the bottom of the pan. 11. While the cake cools, prepare the syrup. Place the sugar and water into a small saucepan. Heat until the sugar dissolves and set aside. Once the cake has cooled, use a pastry brush to paste the sugar syrup all over the cake. Using a spingform pan like these makes it much easier to remove your cake for cooling. This is a good idea if you are a beginner or worried about removing the cake from the pan. There are many ways to decorate a sponge cake – jam, strawberries, grated chocolate, passion fruit and cream.